As things like social media emerge and impact our lives, new words are also needed, created, and introduced. When working with social media, it’s important that you are aware of the most common words and terms so you’re not standing and looking like a question mark when someone asks you something. It’s especially tricky to learn how to speak “social media language” because there are so many words constantly being introduced. To avoid misunderstanding, and help you get better control over social media, I’ve compiled 5 social media words and terms that are essential to know. Messaging on social media is the biggest and most popular activity people are doing on social media. In fact, messaging services like WhatsApp has over 1.3 billion monthly active users and Facebook Messenger has over 1.2 billion monthly users. The point is, messaging services on social media has become huge, and it’s revolutionising the way we communicate. Every day, we send tons of messages, in fact, 55 billion messages on WhatsApp alone, daily. Since messaging using social media platforms has become a natural part of how we communicate, there’s no surprise that people are using these services to reach out to brands as well. For brands, this is a good thing. It lets you build valuable relationships, get to know your audience, show them take you appreciate them, and appreciate their support. However, it is also a ton of work, and demands plenty of resources to always be ready to respond a message. 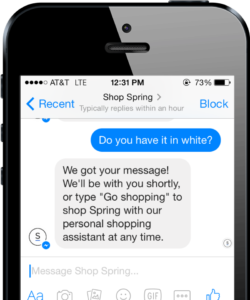 This is where chatbots come in, which is automated messages and replies. I can guarantee that you’ve seen a lot of it on various websites, but now, it is making its way into social media, too! Chatbots can respond to questions and give information to questions written in a natural and clear language. Some chatbots also allows you to place orders through them. 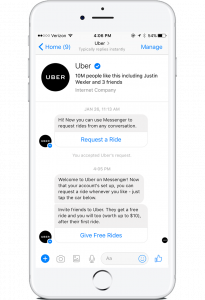 There are plenty of brands that are using chatbots, mainly because they are seeing such huge volume of messages. Some of them are Uber, Sephora, KLM and Whole Foods. Engagement is often talked about in different contexts. Especially when brands are looking to work with influential people on social media, and understand their true impact. Engagement works as a way to seeing the true impact a social media account has. At its core, engagement is the number of interactions you receive on a post. Engagement is often just a loose word, measure in “good, bad, or awesome”, however, it can also be measured with more exact percentage rates. Interactions or engagement on Facebook can be reactions, such as Facebook’s New Reactions“: Love, Haha, Sad, Wow and Angry,comments and shares. Engagement on Instagram is first and foremost likes and comments. Engagement on Twitter is retweets, likes, replies, and comments. Something that is worth mentioning is that there are several types of engagement. The normal engagement is the ones we had as examples, with people actively interacting with your post. However, an interaction can also be that they have clicked on your post but never done any of the interactions that we talked about. With analytics like Instagram Insights and Facebook Analytics, you can see exactly how many people have seen your post and much more. What’s important to know is that they all have the same meaning, although they can be used in slightly different ways. Influencer marketing has existed for a long time. In fact, as long as merchants have been trying to sell goods, and increase sales. First there was influential people, then celebrities, and so on. However, when you talk about social media influencer marketing, or social influencer marketing, this is influencer marketing taking place only on social media. Social influencer marketing has increased in popularity over the years for two reasons: It generates tremendous results, it’s cost-effective. Not long ago, celebrities were some of the most influential people, but with social media emerging, the world of influencer marketing has completely been turned upside down, allowing previously unknown people to build an audience and influence over people. Influencers have a large following on social media, and their audience looks up to them and listens to what they have to say. Apart from celebrities, influencers are considered experts in their field, thus coming off as more authentic and genuine when promoting a product or brand. “Social influencer marketing is the use of influential people on social media to promote a brand, product or service, related to the influencer’s niche”. This is exactly what it sounds like! Social media analytics is analytics on social media, presenting insights in what results you have been able to generate, what you did good, and what performed less good. On social media, keeping your track on your analytics is essential so you know you’ve moving in the right direction, and aren’t doing anything that hurt you. There are a ton of analytics tools out there, many of which are already integrated in your favourite social platforms. Some examples we’ve already talked about, such as Instagram Insights, Facebook Analytics, and Twitter Analytics. Then, of course, you have third-party tools like SproutSocial that gives you more in-dept information about your social media efforts and results. 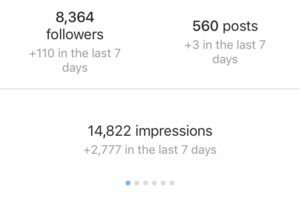 On Instagram Insights, you can see things like exact follower count, impressions in the last 7 days, your total reach, profile views, and so on. You can also see the demographics of your followers to better understand how well you are following your target audience. The bottom line is that social analytics are tremendously important and helpful when it comes to seeing how well you perform, setting goals, and looking at how you can improve. A word that can be seen everywhere is the word viral. It is especially common on Facebook. The quick explanation of viral is a piece of content that get shared rapidly and quickly gains traction. You can see how the popularity for the word viral has skyrocketed since internet came around. The reason you see the term often on Facebook is that people are saying “help this post go viral” and similar. The reasons that is because the only way to get a lot of organic reach and growth is to get people to share your content, and that’s what people do when you go viral. The world is quickly evolving and changing, and so is social media. It’s important to stay on top of the latest trends, words, and phrases, to avoid presenting yourself as someone who doesn’t know what they are doing, and to help make your job of social media easier.